The Civilian – Gender bias: How would audiences respond differently if Trump was a washing machine and Clinton was a can opener? Gender bias: How would audiences respond differently if Trump was a washing machine and Clinton was a can opener? 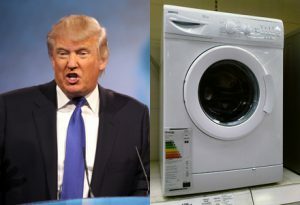 A New York University experiment has found that – perhaps unexpectedly – Trump was even more likable as a home appliance. The traditional wisdom – as held in academic circles – is that gender played a significant role in the outcome of the 2016 US Presidential election. The thinking goes that Donald Trump’s brash and obnoxious braggadocio was only tolerated because he was a man, and Hillary Clinton’s poise, experience and nuance was largely dismissed by many voters because of her gender. But what if it had been different? What if instead of being a man, Trump had been a washing machine? And instead of being a woman, what if Clinton had been a can opener? Only by asking this specific question can we begin to understand the gender dynamics at play. Would Trump have been seen more negatively had he spun around mercilessly making a horrendous noise? And would Hillary Clinton have come off as more likable if she could help you open things like tomato soup or a nice cold one? An experiment by theatre students at NYU sought answers to these questions by re-enacting the entire first presidential debate, with Donald Trump played by a washing machine and Hillary Clinton played by a can opener. Trump, on the other hand, received more positive reviews. Trump also came off as more “personable”, they said, as he slowly walked towards the audience due to vibration. The experiment has been criticised for casting items too similar to the actual candidates.